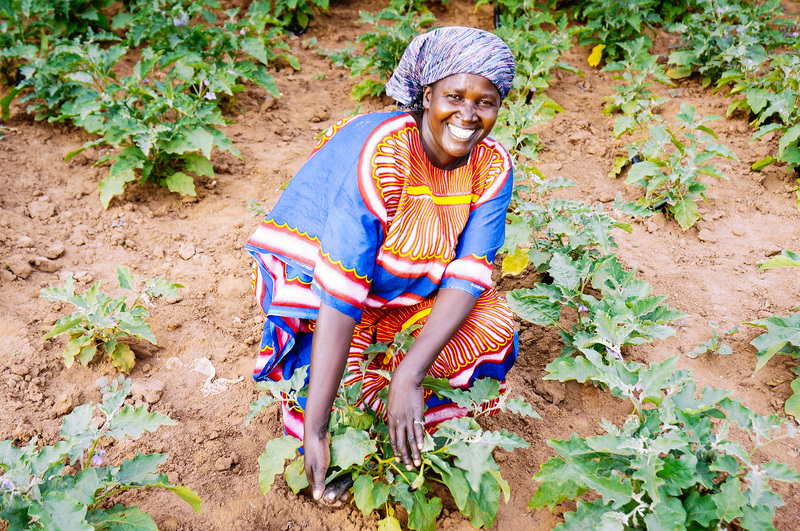 Photo: One of our staff members is happy to check on the growth of the eggplant crop at our farmland. We are very happy to report that the severe drought in Uganda, which started in spring 2016, recently ended, lifting the spirits of our native team and other people in the local communities. Since this drought lasted so long and affected the yield and variety of our crops, and the prices of food spiked 30 percent or higher, which challenged us when buying food at the local markets, the President of the Republic of Uganda recently visited our village to demonstrate how local farmers can increase the growth of more crops using simple and affordable methods to grow more food. The president encouraged farmers to use irrigation methods instead of only relying on rainfall, especially since the rainy seasons often change and thus are unreliable. He recommended sprinkler irrigation systems for those who have water sources, and attaching water bottles to certain plants for those who do not have a water source. The latter method involves fetching water manually from a water source, filling the water bottles, and tying them around each crop plant for a drip irrigation method, but it is only effective for a few crops and very labor-intensive. Thankfully, we have a water source — our campus well — so we will be able to use a sprinkler irrigation system. We are now seeking to raise $5,000 to purchase a piped irrigation system large enough for our farmland. In the meantime, we are utilizing the water bottle irrigation method to grow tomatoes, watermelon, green peppers, sweet potatoes, collard greens, eggplant, passion fruit, mangoes, oranges, and bananas. Also as a result of the recent drought, we ran out of feed for our animals as our grass withered when we had such a severe lack of rain. But we learned of some neighboring villages where the people were in desperate need of animals to sell at market and needed meat as part of their diets. Thus we launched a profit-sharing co-op with the people in these nearby villages. We gave them some of our young calves, pigs, and goats to care for with the understanding that when the young animals mature and give birth, they will share the newborn animals with us so that both the nearby villagers and our native team can split the profits so that everyone can be economically empowered as we recover from the drought. 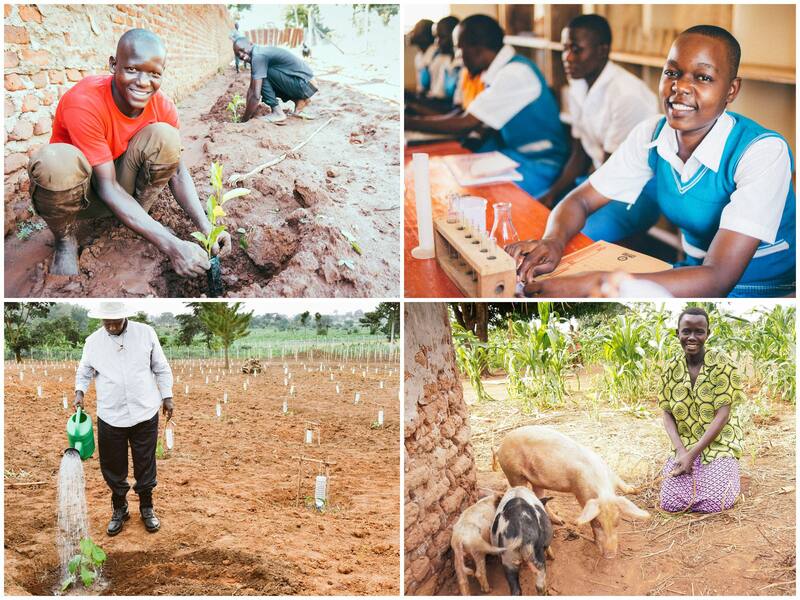 Photo inset: (Top-left): Crops were recently planted on our school farmland. (Top-right): The high school on our main campus is now in its 11th year of operation. (Bottom-left): The President of the Republic of Uganda recently visited our village to demonstrate more efficient irrigation methods. (Bottom-right): A profit-sharing co-op was recently launched where our native team gave local villagers some of our animals to care for in exchange for a share of the newborn animals. We also gave the villagers some rope to secure the animals, we help treat the livestock when they are sick, and we give any other aid when possible. The villagers’ main job is to feed the animals and keep them safe — they can afford feed on a small scale for one or two animals, and they have some existing feed from grass grown on their own properties. The cows have a gestation period of 9 months, the goats have 6 months, and pigs have 4 months, and since the calves, pigs, and goats are young, they will need 1-2 years before they are ready for a mate. So roughly a year from now, the animals will start giving birth. Some examples of the profits are $200-300 for a fully-reared cow, and $50-$150 for a full-grown pig. We are thankful for this problem-solving workaround that also benefits the community. Our other update for you today is about 78 of our high school students who are prepared to take their national exams in October. However, due to some other emergency needs that have set our native team off-budget, they struggled to pay the fees in order to register our students for the exams. The Uganda National Examination Board requires $57 per student to sit for national exams. Our high school was able to pay $25 per student, so they lacked $2,496. As a result, our native team had to “borrow” funds from some of their other programs that are now lacking a balanced budget. With your generous support we are praying to be able to raise the $2,496 to replenish all of our programs and enable them to operate at full capacity again soon. The good news coming from our high school, in its 11th year of operation, is that we currently have 300 students enrolled this semester which began on May 29th. Our students are studying math, English, geography, history, commerce, biology, physics, chemistry, fine art, agriculture, and computer skills. Our students also practice debating skills every Friday, they participate in soccer and volleyball for their physical education, and they are encouraged to speak in English as all of their school subjects are taught in English. We hope and expect to see our students excel in their education, empowering them to live out a hopeful future. We look forward to reporting back about the flourishing of our crops and irrigation system, the profit-sharing farm co-op program, and the progress of our high school students. We are extremely grateful for your faithful support which makes all of these programs possible, blessing the lives of our students and the people in our community.